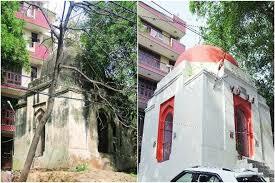 In Safdarjang, New Delhi a Tughlaq era tomb is converted into Temple by the local people. According to Manish Sisodia, the matter is handled by zero tolerance which erupts violence in the area in his letter to Art, Culture, Language Department. Last year INTACH collaborate with Department of Archaeology to restore the Monument but local create problems for them. When the Indian Express visited the tomb after the incident there in the front of the entrance a plastic fibre is placed and the tomb is painted with white and saffron.